Discover Singapore, its attractions, culture, cuisine, events and everything you need to know about it here on eventegg's Singapore page. If one were to describe Singapore in three words, those three might as well be ‘ultra-modernly urbanized’. This city-state has the impression that it was built in a computer game. With buildings touching the sky, super clean streets, shiny stores, nice people and the all-time shining sun above your head, Singapore is a dream place to discover. With 4 official languages and a population of 5 million from 8 different religions, the island offers a multicultural life. Because of the same reason, travelers often find themselves astonished by the harmonious way of living in Singapore. Although the island is not that big in terms of land, it has got 15 districts. All of these worth a visit for their unique attitude which form the soul of the city that will fascinate you eventually. Orchard Road, River Side and Marina Bay are the three that are mostly known and visited. China Town and Little India has been speaking for themselves and giving you the chance to get a touch of those two countries while you are actually in Southeast Asia. There are 4 official languages in Singapore however what you’ll hear the most is Singlish, also known as the Singaporean English. It is a mix of 6 different languages and may be a bit hard to understand at first. Singapore, a land that has an important role in the world’s economic and congress scene today, will be a great adventure to experience. The idea of having been transported to a very friendly and a totally different planet is going to be in your mind during your trip. The smiling faces of the locals and their will to help you will make a difference and probably you’ll always look for another reason to come back there. Singapore is located on southern tip of Malay Peninsula that is on Southeast Asia. Ministry of Foreign Affairs of Singapore provides the necessary information regarding visa. Changi Airport which is located on 17.2 kilometers north-east from the Singapore center is actually a ‘place to see’ in your trip. The airport has been awarded many times and it is considered to be the best airport worldwide. Changi Airport’s Offical Website provides the possible options of transportation to & from the airport. This city-state has got a local transportation system that is compatible with its futuristic look. From metro to buses, trams to trains, a bunch of ways to move around is available and they are easy to use. If you’ll ever learn one single word in Singlish during your trip that must be ‘Makan’ which means ‘eat.’ You’ll notice how important food and the way of cooking is important to Singaporean people the moment you start exploring. And you’ll notice how good they are in the kitchen once you have your first meal in Singapore. The cuisine of Singapore is of course under the influence of many different nations and ethnicities. Peranakan / Nonya, Malay, Chinese and Indian are the dominant ones. It is also possible to find examples of world cuisine. Here are the 10 Singaporean out of the countless tastes for you which will give a general idea of deliciousness of the Singaporean Cuisine. As Singapore is a small, compact place, you’ll get the feeling of it as soon as you arrive. However, it has got so many things to say been there / done that; luxurious malls, holy temples, museums, parks that have all the shades of green are only a small part of all. The Bras Basah area is full of historical sites from the colonial period. The Garden City, Bukit Timah Nature Reserve and Singapore Zoo are the world famous spots for the nature lovers. Night Safari is said to be a real once in a life time experience, try it out if you have time. 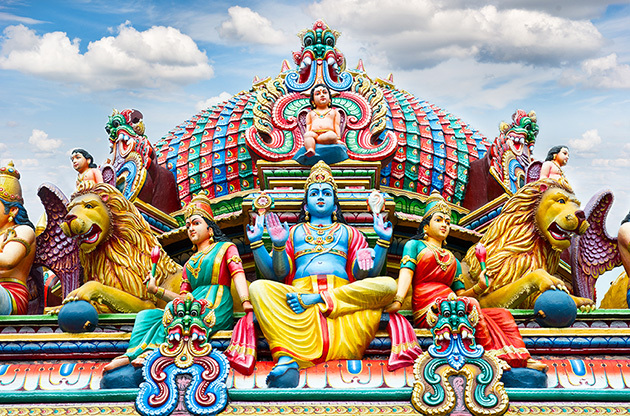 As you are in land where people’s relationship with God differs, it may be a good idea to visit the outstanding sanctuaries; especially Kong Meng San Phor Kark See Monastery and Sri Mariamman Hindu Temple. As the south part of the city is the heart of it, most of the restaurants are located on this area, especially in Riverside district. Remember these two names for an unforgettable dinner with an exquisite view: Boat Quay and Clarke Quay. The nightlife in Singapore may actually tire you since it has literally numerous options. There are clubs open 24 hours and only a small number of bars close before 3 AM. I am sure you’ll find what you are looking for but keep Zouk in mind, as it is one of the most famous clubs all around the world. You can find anything, literally anything, you want in Singapore. All you have to do is look for them in the right place. Orchard Road and Scotts Road are the places where stores like Burberry and Armani winks at each other in Singapore. If you are after electronics, then Sim Lim Square and Mustafa in Little India must be visited. The Peranakan pots, local goods and souvenirs such as the Merlion keychains and Tiger balms can be found on East Coast. Sentosa Island, Pulau Ubin and Kusu Island are popular destinations in Singapore. Relaxing resorts with sandy coasts are located there and a moment of peace far away from the daily hustle is guaranteed. Daily trips to Malaysia from Singapore is also popular. However, the beaches in Singapore also offers quite a new experience without getting far away from the center. Singapore is notorious for some strict rules and regulations concerning food consumption in public transportation and drug offenses. Let me clarify the chewing gum issue: Yes you may chew a gum in Singapore but you can’t sell it. (I didn’t think you would in anyways). Taxi is probably the cheapest form of transport, if you can get one. Alcohol is extremely expensive due to the high taxes. Singapore, the city state where the world’s heart beat at has got many reasons to be a desired travel destinations. Without doubt, one of them is it’s hard to beat place on world’s event tourism scene. Singapore hosts numerous tradeshows, fairs, exhibitions, conferences, symposiums and congresses during the year. As a result, the number of travelers visiting Singapore is increasing rapidly. When the offerings on attractions of Singapore is also taken into account, the reason for its being a top choice to host these important event become crystal clear.